Most of the bed pillows in my house are some pretty sorry specimens, thanks to all the pillow fights. Hubs should really cut that out. I got some new bedding last week, and my sorry old pillows were looking pretty wimpy in the shams. I had a brainstorm and stuffed the shams with two old pillows. They look fluffy and full, and I didn't have to buy a thing. Leave your Works-For-Me Wednesday links below. First timers, check out the guidelines here. 9. Land of Lovings - Fresh Produce for CHEAP! 99. Kirsty @ Momedy Tone your triceps and exercise motivation! 162. Nichole needs your input! Please! 308. Teri @ the Infertility Chronicles - late, but a simple kitchen tip! The links are now closed. Great idea, Shannon. I was just thinking that the sham on our bed is looking pretty pathetic lately. Two pillows should certainly do the trick. I love your pillow fluffing idea. My house is overrun with pillows and this would definitely take care of that! Great idea! I do the same thing. My hubby is not picky when it comes to his pillow, so I stuff two of my flatter ones into his pillow case. He's happy with it. Great idea! Though I don't have any shams...we're still slogging through rennovations, and haven't hit decorating yet! I love the ideas I get from your site! Thanks! I need to have shams first for this to work. I am thoroughly disorganized. I do the same thing. I need to get some new pillows and the old ones will be recycled that way! Thanks for sharing and welcome back! Our pillows are in a sad state, too. I've been meaning to toss them all out and buy more. If I just by pillows for my bed, my kids have been known to steal my new ones and substitute their old ones, so I need to replace all at once to keep up the morale of the ranks. Yeah! Recycling at it's finest :) Enjoy your new shams! Hehe, we've done that before! I've done that before, too, with pillow shams. Thanks for hosting WFMW. I'm really enjoying participating. Shannon, I really enjoy your blog very much and I look forward to reading WFMW each week. I contributed my first WFMW this week--it wasn't much, but it works for me! Thank you for all the wonderful ideas! I've gotten so many great tips from this, I look forward to it every week, even when I don't have a tip to post. Thanks! I LOVE this idea because it is all about reusing and recycling. No reason to throw out those old pillows when they still work just fine. Thanks for sharing and thanks for providing a place for smart ladies like yourself to share their good ideas! Good idea! I know we have a bunch of sad looking pillows hanging around too. Have a great week! Great plan! I need new pillows...but buying pillows can overwhelm me. So many...soooo many. I don't want too fluffy. I DON'T want too flat. Do people actually "try" them out? I mean, should I grab pillow, find a bed (dept. store) and give it a shot?? Thanks for sharing that--I've tried that before and it does make your sham look so good! What works for us today is how to make pinwheels. It is cheap, fun and will keep the kiddos busy! That's a good idea! I have a couple flat pillows that could use some help. Thank you! I've done this too! And we just bought a new bed (a California King!) so my little old pillows just look puny on it. When we upgrade to larger pillows, I'll be using this same trick again to fill my shams! So, last week was my first time participating, and I was really hesitant, because there were SO many people's ideas listed. I thought mine would get lost. But I got so many hits on my blog, and even more importantly, got to meet a ton of new people through comments and e-mails! Thank you so much for hosting this - even though I'm not a mom, I'm finding some really great tips here! I've done this before - works great! If you have extra pillows that are too flat to use, you can save them for camping - roll tightly into your sleeping bag. What doesn't work so well on a bed, feels pretty darn good when you're sleeping on the ground! Maybe I should save this tip for a future WFMW post - oh well! Great idea!! Love this weekly post! my wfmw post is up. love the pillow idea also. I have a friend who does the same thing and I've been meaning to try it with my own shams but haven't gotten around to it. Guess I should! Thanks! Great minds think alike (haven't we done that before?)! I've ended up doing the same thing, and no one is the wiser :). Thanks, This is my very 1st WFMW I've participated in. But I lurk all the time! Good idea on the pillows! I've also heard of storing blankets in the shams. This is my first time posting. I love all the great tips! Thank you for deleting my link so I could fix it. Will you forgive this silly li'l newbie? Have a great day! Thanks for hosting this! I have a lot of those flat pillows. Now I wont need to buy new ones. Thanks! Aw, I wish I had gotten that idea! I tossed out a bunch of old pillows, 'cause they had seen better days! (Granted part of the reason for tossing them was the gross stains) Great idea! Rena, I've done that when I had to buy a new pillow! I didn't want to get a bad one, so I tried it out! Sure got a lot of funny looks from passersby, but I got a good pillow! That's a great way to use old pillows! I'll definitely have to remember that one. 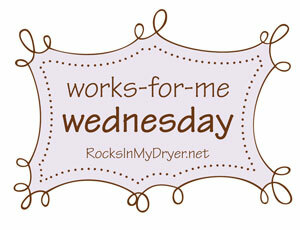 This is my first time to link to "Works for me Wednesday." When you say "please leave a comment" after you link, did you mean here or somewhere else? This is my first time posting on WFMW! I've always gotten great tips here and am excited to finally participate. That really is a great idea Shannon. My problem is finding a pillow that isn't so fluffy I wake up with a crick in my neck! Ha! I do that same exact thing. Most of the old pillows are so flat, it takes two to actually fill the sham! I love Works for me Wednesay. I look forward to reading all of the great posts. Thanks. I've had to do that too! My pillows still don't seem to be at the same level of fluffiness because the four stuffer pillows weren't of equal fluff to begin with...but it's way better than the floppy alternative. My pillow have flanges (one or two inches that hang off at the seam), and I can't get them to stay up...anyone know a trick for that? Great Idea! Maybe I can have a nice looking bed! My husband LOVES his flat, no shape, pillow and has a couple of them.....oh, ideas are coming! Thanks! That's a great pillow idea - I'll have to file it away for reference! Thanks! mmmm that makes me want a nap! The simple things. I'm telling you. Great idea, Shannon! Great idea! Love the idea of not throwing out pillows jsut because they are not super fluffy anymore. Thats a great idea! My problem is that I like it somewhere in between fluffy and flat. I need to stuff 1 and a half pillows in there...is that possible??? What a great idea!!! I always burn the old ones in our hot water stove, lol, and feel a little guilty about it. I do this too. I love finding another use for old pillows besides throwing them away! I took an old twin comforter and folded it just so to fill a king sized pillow sham for my bed it is a perfect fit and very full. I actually do this in all of our shams. That is so funny. My husband hates trying to get two in there but I tell him it is SO worth it!! We actually do this in all our shams. That is so funny. My husband hates trying to get that second one in but I just convince him it is SO worth it! I stick my old pillows into shams too but I never thought to stick two in there! Good idea. I'm also a first time WFMW poster. Not sure if others will have success, but it definitely worked for us! I've done this, too! And, I rip open old pillows and reuse the "stuffing" to fill throw pillows. for some reason we have a bazillion pillows and no pillowcases! Could it be that they were all used as Halloween goodie bags and not replaced? Loved your ideas! Thank you for hosting this carnival. It is HUGE! I can't wait to browse through here to see what I can learn! Hi There! I hope it's okay that I posted two "What Works For Me's" because this really does! Thanks again for the fun carnival. I'm sorry, Shannon, I totally did not mean to post the same link twice! I'll do better next time! I love it! Thanks for doing this. I can not wait to meet more people. Not a bad idea. :) I'll have to remember that one.